I’ve struggled with my weight throughout my life. I’ve tried various methods to address that – some more successful than others. For instance, 12 years ago or so, I tried Atkins with a reasonable amount of success. I dropped from 235 to 200 in a matter of a few months. During that time I did some treadmill running – nothing very structured, but it’s better than I was doing before. Before that in the summer between my junior and senior year of high school, I have to admit, it was Richard Simmons with a combination of deal-a-meal and Sweatin’ To the Oldies. I even tried Tae-Bo at one point. So the latest has been Weight Watchers. I’m not going say the program’s bad or doesn’t work – I don’t think that’s the case. 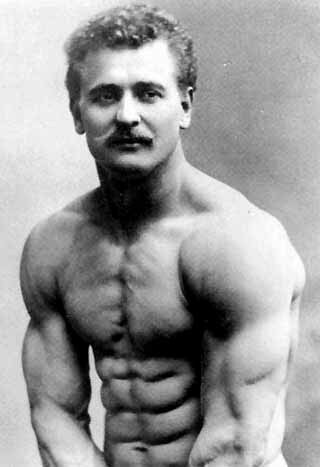 But I’ve definitely noticed cutting the calories is not enough to become another Eugen Sandow. Besides, I just don’t lose weight under stress, at least in the shape I’m in, and 2 years after starting, I’ve regained half the weight I lost. All along I’ve known I need the right kind of training to get there without having had much help or guidance. Then came Pavel. While browsing all the weight training books at Borders one days, 90% of which looked goofy and made me feel ridiculous, I stumbled upon Enter The Kettlebell – by far the most entertaining book on fitness I’ve ever read. Pavel writes with the full bravado, confidence and humor of someone who ironically, actually knows what he’s talking about. How can you not love a book that promises “fat loss without the dishonor of aerobics”? I was hooked, and after visiting a local kettlebell class, I ordered my very own kettlebell from walmart.com (the cheapest I could find in the right size that seemed to have some quality) and the companion video version of Enter The Kettlebell. Again, the most entertaining fitness material ever. Even my 3 years old Levi watches it. Really. Back to my journey though. I purchased that book and video just over a year ago, and still find it hard to stay consistent. Granted, life has been exceptionally hard this past year. My routine in life got severely disrupted and I’m the first to admit I wasn’t all that ready for it, so it was easy to let exercise slip. But I’ve recently made arrangements to change that, which I’ll be announcing in my next post. For now, I’ll say, I’m embracing the fact that I’m well below even beginner status when it comes to weight training and I’ve had that demonstrated to me very clearly this week. But, like I said, I’m putting myself out there and think this time it will stick.